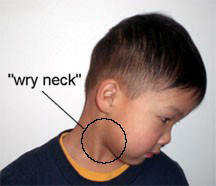 Torticollis, also known as wry neck, is a congenital or acquired condition of the neck. It is a deformity of the neck which is characterized by the head tilting toward one shoulder with the chin pointing toward the opposite side. This condition is the result of the shortening of the sternocleidomastoid (SCM) muscle, a muscle that runs along the side and front of the neck. Due to the muscle shortening, it can cause a significant limitation of neck mobility for a child. There can be permanent effects on the child if torticollis goes untreated. Therefore, early identification and physical therapy are the keys to regaining normal neck movement. Congenital muscular torticollis is the most common form of this condition. During early infancy a firm mass may be felt in the midportion of the child’s SCM muscle. This mass may or may not be tender and the child may or may not demonstrate signs of pain. This mass generally disappears after the first few weeks of infancy, and the muscle may just feel tight and shortened. In most cases the SCM on the right side is most commonly affected. Torticollis that presents itself in infants older than a month old who do not have a tight SCM muscle could display signs of another condition. Therefore, it is important that a careful evaluation by a physician be performed in order to rule out abnormalities of the cervical vertebrae or other common developmental issues. Torticollis can also be acquired during the early years of childhood. During this period the child may complain of a sudden onset of pain and stiffness in the neck, usually on one side. The child may simply be experiencing a stiff neck but again a more detailed evaluation by a physician should be performed to rule out other conditions of the neck. If torticollis goes untreated there can be permanent limitation of neck mobility and facial deformity including flattening of the head and face on the affected side. Physical therapy is the treatment of choice for torticollis and is most often very successful. In physical therapy, the physical therapist will instruct the parents or caregivers on stretches and proper positioning techniques to perform with the child at home. A course of physical therapy for up to three months is the common treatment plan. If physical therapy does not help resolve the problem, a more detailed evaluation should be performed. Surgical intervention which lengthens the SCM muscle may also be a treatment option if conservative methods are unsuccessful.